Even with the fanfare and glut of tourists that flock to Unesco World Heritage sites, Hoi An has done a decently good job at keeping the small town feel. Vietnamese is my favorite of the Asian foods; I had been searching high and low and finally found delicious bun thit nuong (BBQ pork cold noodles) along the river. The first night, it was difficult to eat only one bowl – this is what I had come to Vietnam to eat! Houston has a sizable Vietnamese population, so I grew up eating banh mi (Vietnamese sandwiches). But Hoi An made me forget all of that when I had the best banh mi of my life. 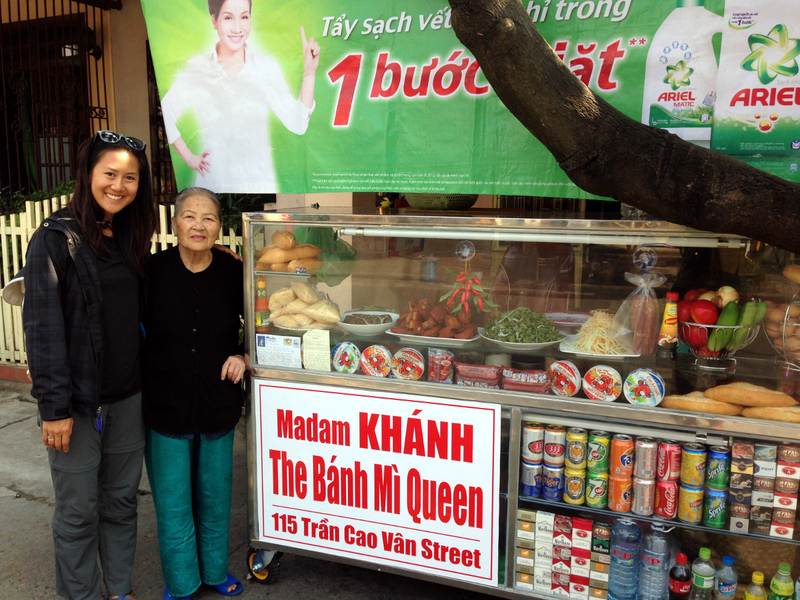 Madam Khanh the Banh Mi Queen lives up to her name. The queen understands that sandwiches are all about the sauce! She is deliberate as she picks through the pork with her chopsticks, until she finds the one that is just right, before dipping it into her amazing sauce. And the toasted bread! On our last day in Hoi An, Matt went for it and ate three sandwiches. Two months later, we still dream of that sandwich. The old city is situated on along the Thu Bon River. Known for their tailors, I seriously contemplated getting my bridesmaid dress made here (seriously an identical look-alike for $30!). 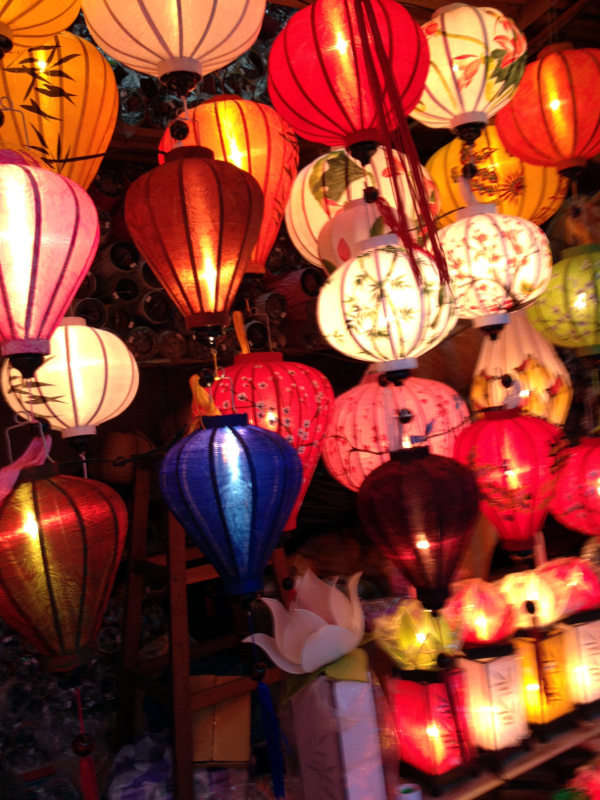 At night, ladies sell paper lanterns with a lit candle that are sent down the river for good luck. A beautiful thought, but I can’t help thinking of the environmental implications. In the past, the boats were made of banana leaves, leaving minimal impact, whereas now, a wall of colored paper can be seen at the dam downriver. Phuc reached out to us through CouchSurfing and graciously agreed to meet for lunch. 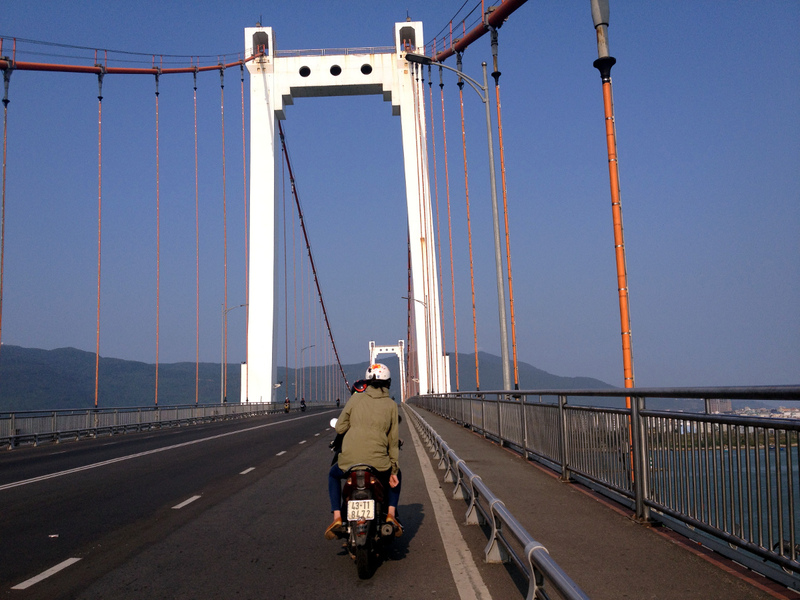 We rented a motorbike for a 45-minute drive over to Da Nang. 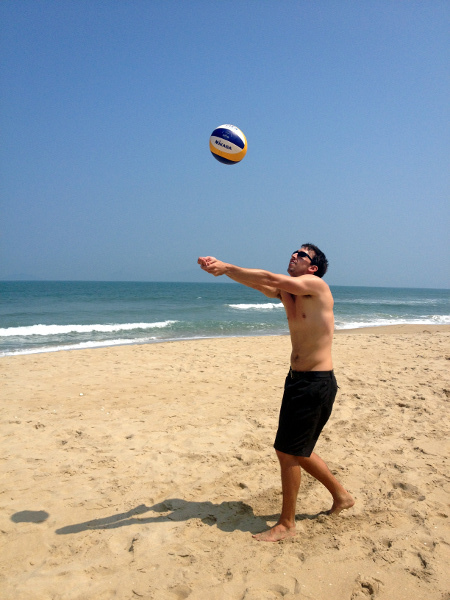 On the way, stopped at An Bang and played volleyball (this is for you, Johnny and 14th St!). Phuc’s family have a clothing shop storefront and live in the adjoining space behind. We were humbled to be the first foreigners in his house. We thought that we were just having lunch together, but Phuc and his family were so generous with their time and spent the entire day with us! He lives with his parents and younger sister. His father gave us a warm reception and is a very kind man. His sister, Hien brought out a pots of tea and a plate of rice paper, fresh herbs, and pork. We sat around their living room chatting and making fresh spring rolls. Vietnamese New Year had been the week before, so we snacked on candied ginger, sunflower and watermelon seeds. I really wish that I could understand and speak Vietnamese to communicate better with their father, but Hien was kind to act as translator. Hien’s friends from school came over. Thuy had been first-runner-up Miss Danang, we were among local royalty! No translator was needed when the beer came out – round after round of clinking of glasses and yo (cheers). If we hadn’t had to drive the motorcycle back to our guesthouse, the day could have turned out quite differently. Phuc, Hien and Thuy generously took us on a driving tour around Da Nang. What a thrill, zipping in and around traffic in a motorcycle. Second nature to our hosts, I was glad that Matt was the one driving. 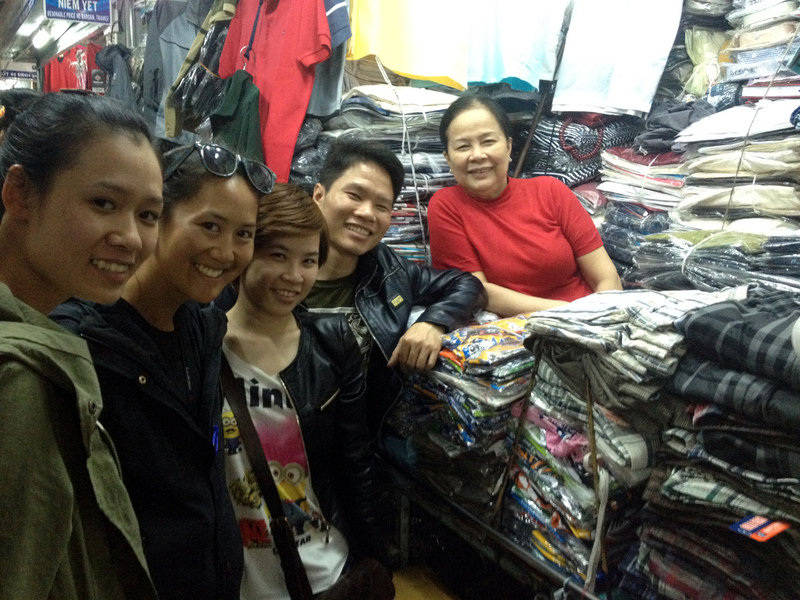 First, we visited the main market where his mother sells clothes. We ate a traditional soup before heading across Danang’s suspension bridge to Linh Ung Buddhist Temple. The walk around offered a panoramic view of the city and bay. The temple was very crowded with locals paying their respects for the New Year. We finished at a local coffee shop (Vietnam has a very strong coffee culture). We only wish that we could have stayed longer (bike rental ended at 7PM) so that we could have gone out and karaoke-d with them! 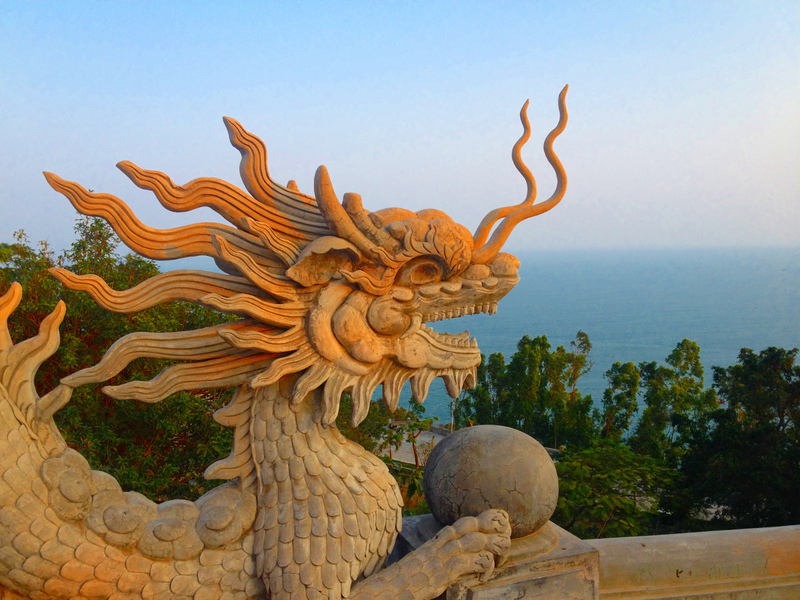 Phuc, Hien, Thuy and their families were so generous with their time and showed us a fantastic day in Danang. I only hope that our paths cross again in the future! Thank you again! in google. You write awesome content but you should rank your page higher in search engines.